While I readily admit to being a “science geek,” it isn’t necessary to be a geek to enjoy this book. I did find the title to be somewhat disconcerting because of the words “secret power of the universe.” If I hadn’t read previous works by Dr. Radin, as well as journal articles he has authored, I probably would have passed on this book because of the title. I’m glad I didn’t. Magic has been a part of human experience throughout human history. Anything that we didn’t completely understand was often relegated to the realm of magic. 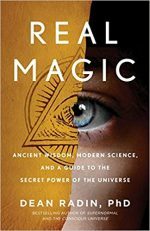 Dr. Radin provides some excellent historical references to the story of magic, but he is more interested in helping us to give up our preexisting beliefs about what might, or might not, be real. He implores us to be willing to look at the data regarding the things that he refers to as “real magic,” topics he has been studying for the last 40 years. Many of the findings will cause you to question how it could be possible, or to doubt the data, and that is exactly his point. Because we don’t understand how it could be possible, doesn’t keep something from being real. Conversely, just because one study shows a significant result, doesn’t mean the finding is definitive. Have you ever had the feeling that someone is staring at you, only to look around and find that someone really is? Is it just coincidence or is there more to it? There have been many scientifically conducted studies (more than 60) that indicate individuals are able to correctly identify when they were being stared at much better than chance. In fact, the odds of it this above-chance were calculated to be 202 octodecillion (that’s 57 zeros) to 1. Other findings referenced by the author include precognition, retrocognition, remote viewing, and remote mental influence among others. I found it enlightening just to find out how many studies have been, and are being, done in these areas and how consistent the results seem to be. Many of the studies referenced used ordinary people with no preconceived idea of any special ability. The author makes a convincing argument that human consciousness (which we still do not understand) is capable of being influenced by, and influencing, many things in our environment including other people. He believes that we all may have the capability to do miraculous things and that instead of denying the possibility we should embrace it, investigate it, and use it to benefit ourselves and our fellow humans. This book has the potential to change the way you view magic, science, the world as we currently know it, and human capabilities. The author has a unique gift for entertaining even as he educates. The arguments and experimental results are stimulating, entertaining, and in some instances, shocking.